The Stressed Stone is now Super! We had started the conference by laying stones down as a symbol of us letting go of the burdens we were carrying and at the end of our time together we encouraged everyone to take away one of the stones as a reminder that we should ‘bear one another’s burdens’. The hope is that the stones will inspire us to pray for and to offer support to others who were at the conference. My daughter was asking me why I had brought a stone home and so I explained that it was there to remind me to pray for people who were worried and anxious. She offered to decorate it at this is what she came up with. 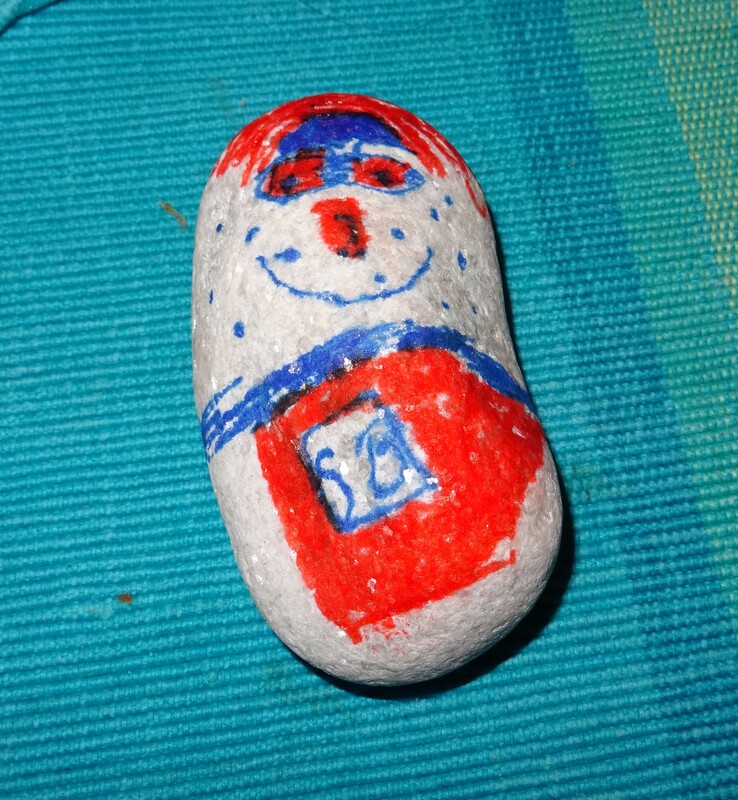 The stone that once symbolized anxiety and stress has now become super Bob and my daughter says that he is coming to the rescue. Superheroes need to be empowered and this stone now acts as a great reminder to me to pray for other ministers who are overburdened that they might be empowered by God. One of the biggest mistakes that Christians make is to try to come to the rescue of people in our own strength when God longs to empower us and to work in and through us. Who can you pray for today that God might meet with them in their stress and empower them! Hi, my name is Graeme and I’m married to a very patient wife. We have 4 children, 2 rabbits, a terrapin (and not a lot of peace and quiet!). I’m a Regional Minister for the Eastern Baptist Association in the UK (the views expressed in this blog are my own) and I am especially interested in making Church accessible to people who have no church background and also in how we disciple people in order to equip them to live out their faith in the 21st Century. This entry was posted in Blessed to be a blessing, encouragement, Faith, God is with us, Holy Spirit, Life experiences, Power of God, Relationship with God and tagged EBA, EBA ministers conference, empowered by the Holy Spirit, prayer. Bookmark the permalink. 2 Responses to The Stressed Stone is now Super! A perfect picture of you June! Perhaps your superhero name is Bob?